The flags of the Crusaders flew at Parklands Resort on the weekend as Mudgee hosted The Great Priory of the Order of Knights Templar in NSW & ACT. 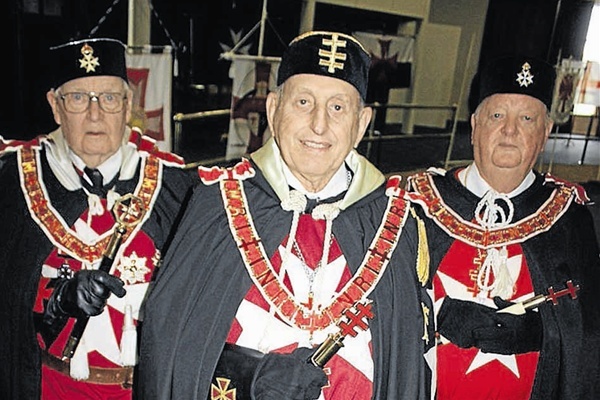 The Grand Masters of Queensland and Victoria, the Assistant Grand Priory Royal Arch of NSW and the Provincial Great Marshall of Somerset, UK, were among members who gathered for the Order’s Malta Festival. The Masonic order’s regalia and ceremonies are based on those of the Knights Templar, who are best remembered for their military role in the Crusades, but also established a monastic order dedicated to protecting pilgrims. The Knights Templars also founded an early form of banking, under which pilgrims deposited their valuables with the Order before leaving, and in return received a letter of credit to the value of their deposit, which could be redeemed when they arrived in the Holy Land. The Order has preceptories in Broken Hill, Wagga, Albury, Moruyah, Tamworth, Grafton, Ballina and smaller centres including Geurie, which hosted the weekend’s event in Mudgee. Preceptories have a charitable as well as fraternal role, giving to causes such as schools. In addition to a business order on Monday, the Great Priory installed a member into the Degree of a Knight of Malta and invested its officers for the next 12 months. Following the Malta ceremony banquet on Saturday night, members attended a church service on Sunday which was open to members of the public. This entry was posted in Illuminati Elites, Secret Societies. Bookmark the permalink. How can one obtain the address and membership forms of the Knight Templars. See the Secret Societies section toward the bottom right of this blog. There are many Templar organizations to look up and join. That is if you are hellbent on serving the occult theocracy of the elite. These Older than dirt men. Are not Knights!!! There senior citizens in a fantasy world.